The modern state, however we conceive of it today, is based on a pattern that emerged in Europe in the period from 1100 to 1600. 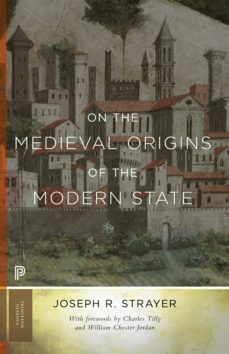 Inspired by a lifetime of teaching and research, On the Medieval Origins of the Modern State is a classic work on what is known about the early history of the European state. This short, clear book book explores the European state in its infancy, especially in institutional developments in the administration of justice and finance. Forewords from Charles Tilly and William Chester Jordan demonstrate the perennial importance of Joseph Strayer’s book, and situate it within a contemporary context. Tilly demonstrates how Strayer’s work has set the agenda for a whole generation of historical analysts, not only in medieval history but also in the comparative study of state formation. William Chester Jordans foreword examines the scholarly and pedagogical setting within which Strayer produced his book, and how this both enhanced its accessibility and informed its focus on peculiarly English and French accomplishments in early state formation.